I will admit that they are creepy looking. And yes, they hide under the shingles of your house or the pots on your deck. Certainly, they eat dahlias, butterfly bush and young annuals early in the season. Nevertheless, Earwigs are beneficial insects. Earwigs eat decaying plant matter and even some other insects. You’ll notice that they do more damage to plants early in the summer and this is because there are fewer decaying foliage or other insects at this time of year. The same dahlia that might be shredded early in June won’t be touched in July or August. This insect is a good lesson for we Homo sapiens. Earwigs remind us that just because a bug looks scary doesn’t mean that it’s harmful. They are a lesson in the importance of patience and thought. This insect reminds us that in nature things are always changing but usually work toward balance. 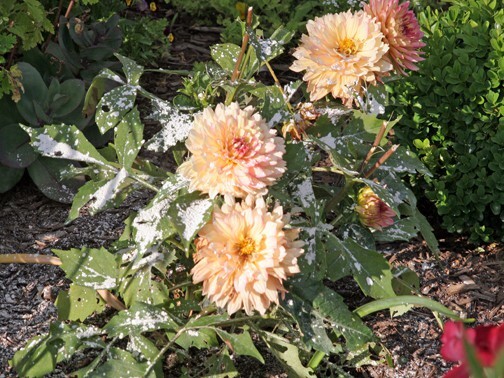 If your plants are being eaten by earwigs early in the season just dust them with diatomaceous earth. Or roll up wet sheets of newspaper into tubes and place them around the garden…earwigs will hide in the tubes in the daytime allowing you to pick up these traps and throw them in the garbage. Know that if you are able to control the damage early on with diatomaceous earth, however, the earwigs will move on to helping old foliage break down into your soil. Yes, they look creep but they are neither totally good nor completely bad. They have their place, just like us. When I planted these dahlias I forgot about earwigs. They, of course, moved right in and began to shred the leaves. I dusted with the white diatomaceous earth and the damage stopped. Note to self: dust newly planted annuals right after they go into the garden and avoid the damage altogether. Further note to self: these are not bad insects, just opportunistic creatures looking out for their own best interests. Like us. We can coexist.